Well, it looks pretty. 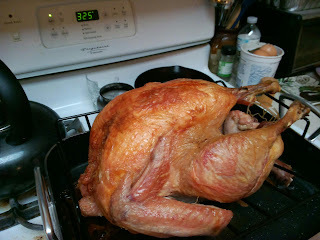 :) I once totally overcooked the turkey for Thanksgiving. Not enough gravy in the world could help you choke it down. Also, I forgot to make stuffing....oops. I find that the turkey is the easiest part about hosting Thanksgiving now. My aunt taught me a trick, prep your bird, put in roaster and cover tightly with several layers of foil (or the lid if you dont cook 20 pounders like me), cook for 1 hr at 350 and then OVERNIGHT (say, from 10ish to 6) at 250-275. Perfect and juicy. You could brown it that first hour if you like it that way but I don't.